It is a white bag this time with blue horizontal stripes on it. The bag looks summery, really soothing and calming to the eyes. 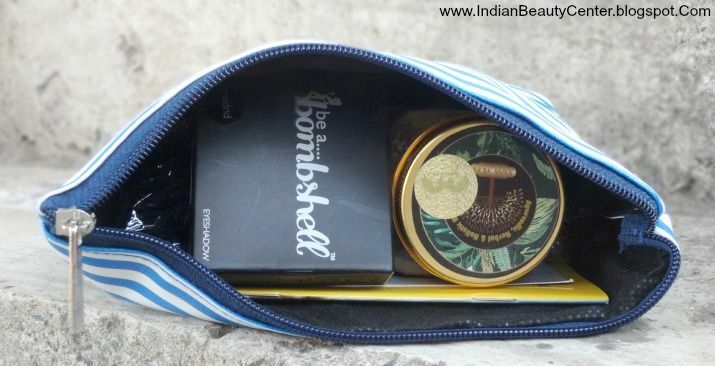 This pouch holds all the contents of the bag properly and none of my products were damaged. Furthermore, the quality of the purse is really nice. The first and foremost product that caught my attention was the Bling : My Fashion Dimension scarf that I got as the Fab Bag Bonus product. This is a light and thin scarf that you can team up with kurtis or use it as an hair acessory, as mentioned in the Fab Post, which is the FabBag magazine. I could see a small tub in my bag from Sand Sopaholics. I checked it out and it basically is a facial cleanser, a combination of edible and medicinal plants. This face cleanser claims to repair, nourish and maintain your skin's health. It costs Rs. 710 for 50g. I got a sample sized product in my May Fab Bag (quantity not mentioned). 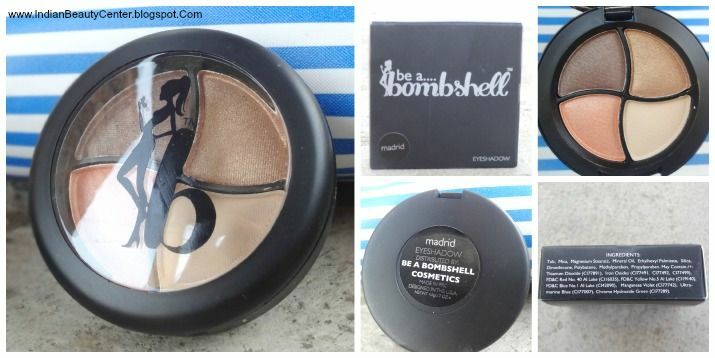 I received, in my fab purse, the be a....bombshell eyeshadow - Madrid containing really pretty shades. This is a new brand and this eye-shadow claims to have a gradation of colors which is a one-stop answer for the glitzy eye look. There are 4 shimmery shades in this quad, and I really love the combination of colors. Perfect for the wedding season. This one costs Rs. 1200 for 4.8g and is full-sized. 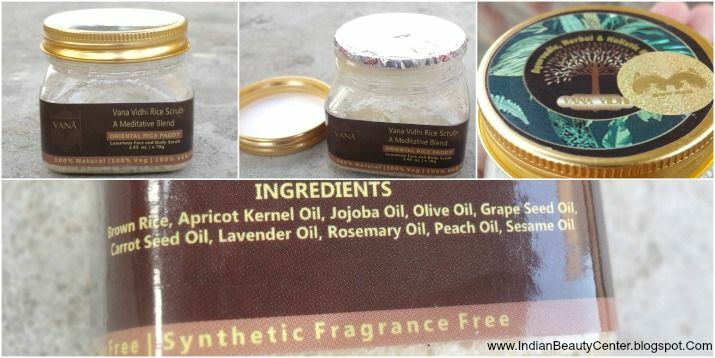 Finally, I checked out Vana Vidhi Rice Scrub- A Meditative Blend. It is a luxurious face and body scrub that is 100% natural, vegetarian and paraben, sulphate, color and synthetic fragrance free. It has a really strong fragrance of Lavender Oil. I am really excited to try this out as it seems really promising. It is a full sized product and costs Rs. 1599 for 70g. Overall, this month's FabBag is really amazing and contains really expensive products for the face and eyes. I am curious to try the rice paddy scrub and also use the eye-makeup. The Sand for shopaholics cleanser looks interesting and comes in a tub packaging. It smells really strong and honestly, I am a bit sceptical to use it. Will definitely let you guys know about all the above mentioned products soon. Waiting for many more amazing fab bags to arrive! 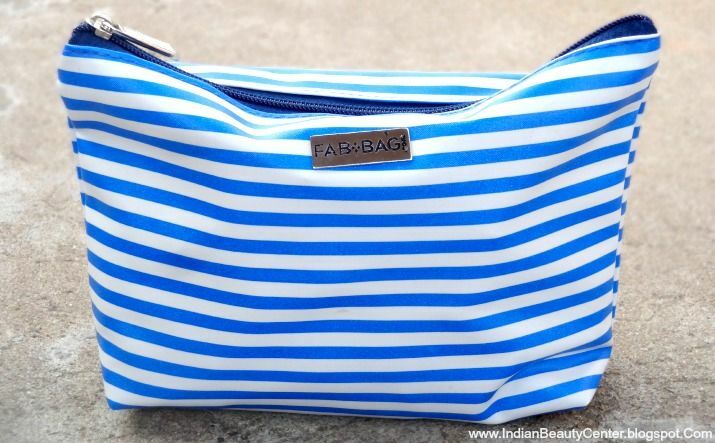 So, buying fab bag turns out to be really profitable for all the beauty and makeup enthusiasts. 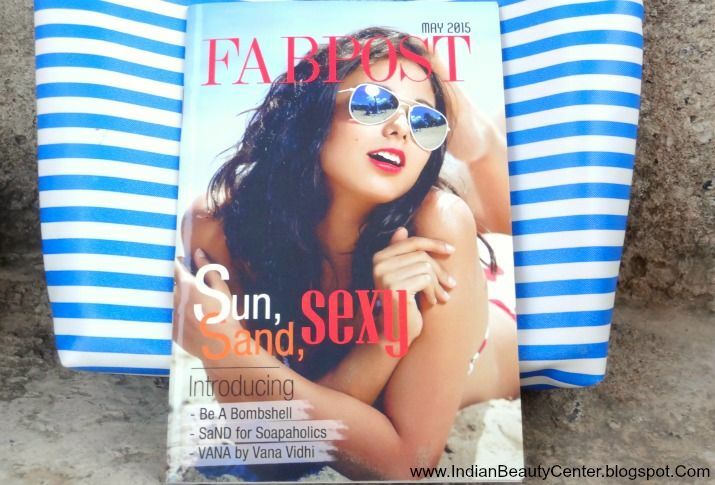 What did you receive in your May Fab Bag 2015?